My visit to 'Bespoked 2012' was actually the 'main dish' of a three-course cycling day. The 'hors d'oeuvre' had already been served very very chilled – a freezing, early morning ride to Salisbury train station to catch the 0730 departure to Bristol. The compensation was going to be a 'hot dessert' – my ride home in glorious sunshine. My plan was to use the Bristol and Bath railway path to reach Bath (not surprisingly), navigate the city centre, then ride the Kennet and Avon Canal towpath as far as Devizes before reaching home on back roads through the Pewsey Vale. In completing this ride and given that Bristol and Durrington (my home village) both have different River Avons, I may have inaugurated the Avon2Avon cycleway! 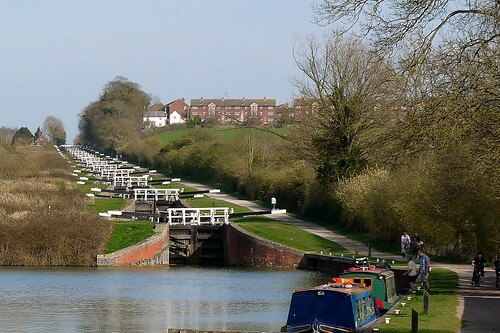 The dramatic flight of 16 locks at Caen Hill, Devizes – after 35 miles, my first real hill of the day. The railway path and canal towpath elements of my ride form part of Sustrans' National Route 4 between London and Fishguard. However, my Avon2Avon cycleway started right outside Brunel's old station in front of Temple Meads railway station. 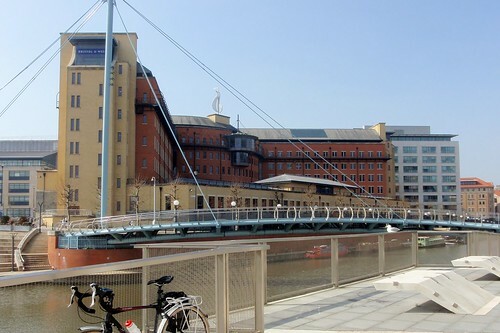 Thankfully the route immediately took me onto a cycle path away from the inner-city traffic and onto a curving modern bridge over the floating harbour. Below, the narrow boats appeared almost vulnerable on such an open expanse of water. Much urban regeneration is evident here – the old dockside warehouses have been replaced with shiny office buildings, apartments and the inevitable coffee shops. The seagull sat on the handrail at least suggests a link to Bristol's maritime past. 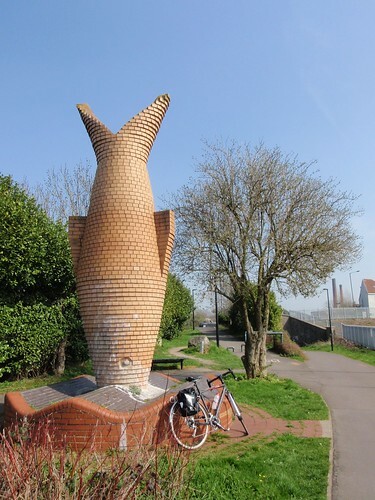 From the floating harbour, it was only a few hundred metres ride on back roads to St. Phillips Road and the start of The Bristol and Bath Railway Path – a 13 mile off-road (but tarmac-ed) route between the two cities. 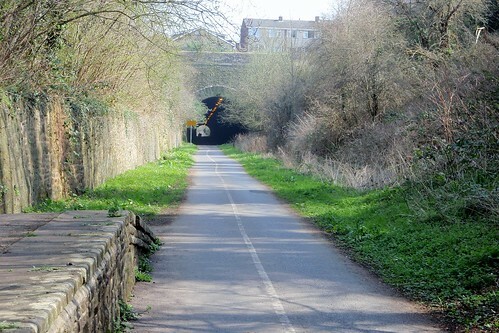 The first few miles on the Railway Path are uphill (albeit a 1 in 65 railway gradient – so not the worst) out through the Bristol suburbs. I am sure there is a poem (Betjeman?) that describes travelling by train through a town or city as 'like sneaking in and out by the back door' – you never see the fronts of buildings, all you see are back gardens, factory yards and allotments. This fairly described my view of Bristol from the railway path as I slipped through residential and semi-derelict industrial areas. Just beyond an old station with a single platform still evident, came the 513 yard long Staple Hill tunnel. Cycling into the semi-darkness I had to concentrate because even though there is some lighting, the tarmac occupies only half of the tunnel width and cyclists were coming in the other direction. Two tunnel vents provided a glimpse of daylight overhead. Looking towards the tunnel. If you look carefully, you will see that the 'white-line' person seems to have been getting nervous about the impending darkness! Beyond the old triangular junction station at Mangotsfield and bridges over dual carriageways, Bristol finally gives way to countryside. The old Warmley station nows houses a coffee shop and it was doing a roaring trade in ice cream. I managed to resist, although I did stop briefly to admire the metal statues of passengers waiting for trains that now will never come – do you think Dr Beeching was a CTC or Sustrans member ahead of his time? Refilled my water bottle from this sculpture – better than a simple tap. The Avon Valley Railway shares the route for a while and I stopped at Bitton station for coffee and cake and to admire the preserved steam trains. 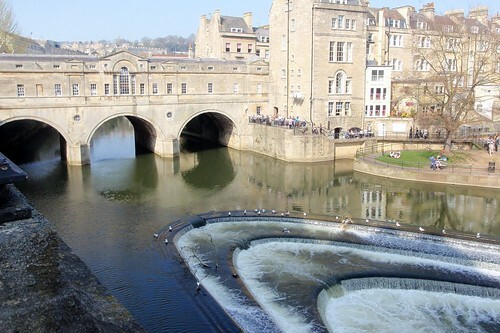 And then onwards to Bath, crossing and recrossing the River Avon on high bridges four times in four miles. Bath proved a rude wake-up after the traffic-free miles from Bristol. The shoppers and tourists were out in force, seemingly unaware of the cyclist bearing down on them as they strolled in the middle of the road. Pulteney Bridge in Bath and far too many people. I cycled through the Georgian streets of Bath and picked up the Kennet and Avon canal towpath on the far side of the city. There were many boats on the canal, both moored and moving, and the towpath was popular with many other walkers and cyclists. Although the surface was unmade, the dry weather made the cycling very easy, if dusty. As ever I was wary of the canal bridges – both of the potential for meeting others coming the other way, and of the slightly loose surface – although the weather was hot, the water did not look inviting! Just before Bathampton, a steam train ambled past on the adjacent railway line. There was even a narrowboat at Dundas that sold ice cream. Idyllic! 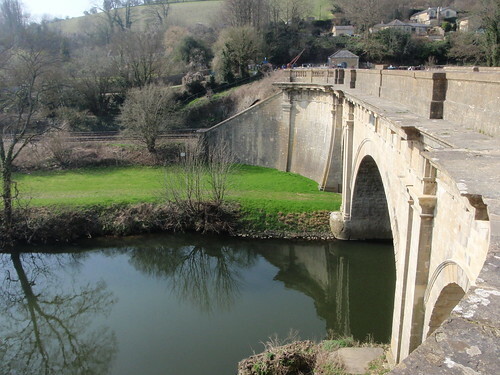 Looking back across the Dundas aqueduct, which carries the canal over the River Avon and the railway line. 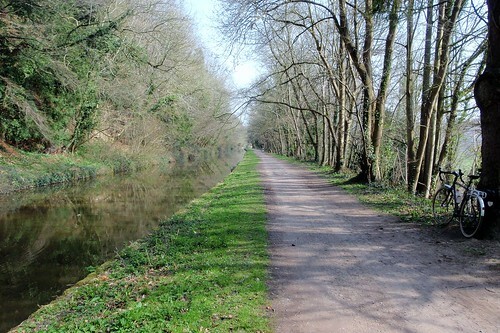 And the miles of cycling alongside the lock-free canal through a tunnel of trees to Avoncliff aqueduct, where the towpath doubles back under the aqueduct and back up onto the other bank of the canal. Beside the canal in Bradford-on-Avon, an impressive 14th century tithe barn provided an opportunity to get off the bike and stretch the legs for a few minutes. Tree-lined wide canal – it looks vaguely French to me. 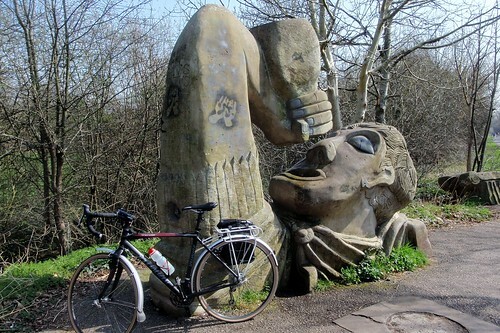 The final miles on the towpath were 'enlivened' by a very strange occurence – something called a puncture! A thorn had penetrated straight through the kevlar belt of my rear tyre – removing the offending item proved a struggle, but at least it wasn't raining. And then on to Caen Hill flight – shown in the first picture in this post. Apparently it can take narrowboats 5-6 hours to navigate all the locks here. I managed the 'uphill' in slightly quicker fashion, buoyed by the knowledge of the cafe at the top! Cake, coffee and ice cream were duly despatched. The final couple of miles on the towpath through Devizes was enlivened by views of the Wadworth brewery. I could have stayed with the canal through the Vale of Pewsey, but the towpath had become more of a grassy track. I therefore opted for the higher speed and comfort of tarmac and so took to the roads towards Alton Barnes. 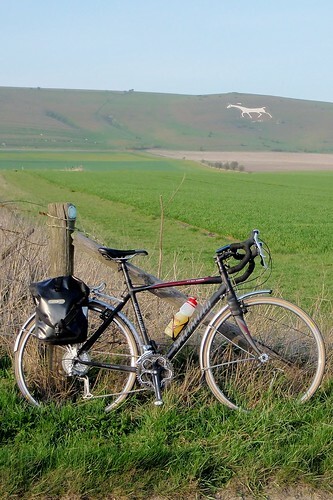 The Alton Barnes white horse, one of several in the local area. A final turn south through the villages of Upavon and Netheravon – their names suggestive of the second River Avon of this trip. This River Avon is the one that flows through Salisbury to enter the English Channel at Christchurch – the Hampshire Avon, not to be confused with the Bristol Avon. The final River (Avon) crossing of the trip was another pedestrian bridge, allowing me to sneak into my home village of Durrington, much as I had snuck out of Bristol sixty miles before – seemingly by the back door. Posted by Tim on April 7th, 2012. Good post Tim with some great pics. I like the idea of sneaking in and out of cities 'by the back door'. It would have been nice to cycle to the show but I'm afraid I took the easy way out – train both ways from Southampton. Dedicated cycling lanes or paths make a lot of sense in big cities. My absolute most hated situation is riding along a bike lane and have it abruptly end in traffic. We have one notorious example which throws the cyclst into 4 lanes divided traffic travelling at a speed limit of 80 km, and then the bike lane reappears after less than two kilometers. Why? one asks. Brick work fish help, though. I'm not convinced they will never come again. Some time in the future, narrow gauge rail (and canal transport) if the network of routes, bridges, locks etc are preserved. Or even a type of vehicle that doesn't yet exist. Okay... it might take another Brunel to make it happen but you never know! I used to live near Bath. It is quite crowded but it makes up for it with several good bike shops.